Take your Mossy Oak camo out of the woods and bring it into town with the new GWG Punched Out Buck Tee! 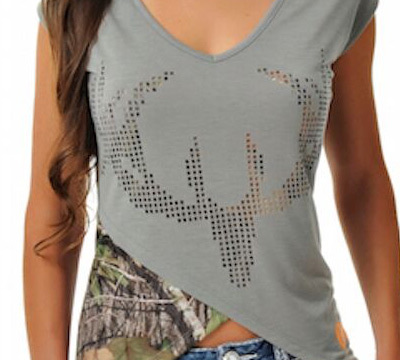 Featuring a fashionable camo buck head and flattering criss cut shape, this is a tee every country girl needs. Features include: Laser Cut Buck Head, GWG Logo Back Neck Tape, GWG Hi-Gloss Puff Screen, Embroidered 2009/ Est. at Hem, 94% Polyester, 6% Spandex, and imported. LIMITED TO STOCK ON HAND. NO BACKORDERS.